The BGE Sprite Addon lets you add real-time animated textures in the Blender Game Engine, replacing the old and inconsistent ‘UV animated texture' method with a better and more capable system. Problems with the current system. The current 'UV animated texture' system has caused many hours of frustration. Most attempts to use this system are crammed with issues and problems that don't really have a solution. The worst part is that it seems like there are no decent alternatives for artists to use. This addon was built to completely eliminate all the issues of the previous system and add extra 2D capabilities so that an artist will not be limited by their ability to code! Easy Camera Alignment (Make object always look at player regardless of angle). "This addon takes the most tedious step in Blender game development and actually makes it fun!" "Awesome Addon! I always shied away from using animated textures in the Blender Game Engine, as they were so hard and time consuming to set-up. With this addon, animated textures can be created as easy as it gets! I will definitely make use of this addon in future game projects." 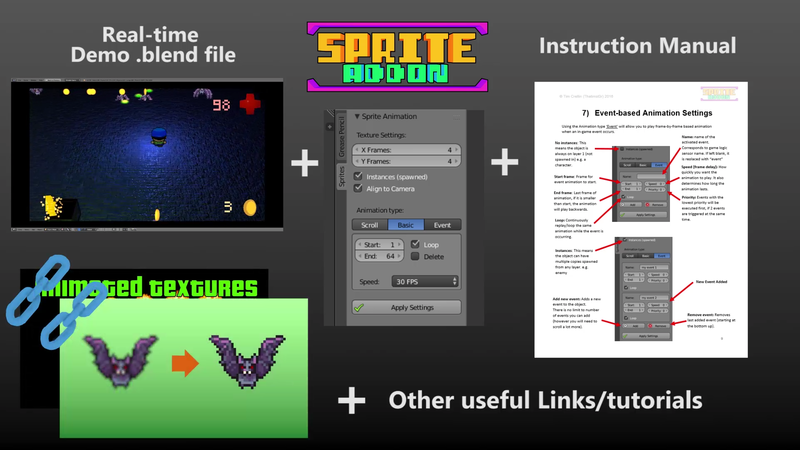 "Usually doing anything with sprites in the BGE is a huge hassle and you can forget about having any interactivity, but using this addon it can be easily done with just logic bricks!" Includes explosions, sparks, dust, smoke, fire, spinning coin. This update adds the ability to have multiple UV's scrolling in different directions, giving the illusion of waves in water as well as underwater caustics. Examples of both are provided in a .blend along with a simple tutorial on how to setup the effect. This update adds the ability to have multi-material event based scrolling to allow for more complex functionality such as tank treads. - tank demo .blend game. At this point the addon no longer supports UPBGE, as their fork API is almost completely different to that of the standard game engine. For this reason I will only be supporting the current game engine build that is packaged with blender. There were some incompatibilities with the new BPY API, which caused the addon to crash when removing scripts. This is now fixed. Full 13-page documentation + Trouble Shooting + Support Email is available in the instruction manual that comes with the addon. Does this addon fully support UPBGE? Unfortunately UPBGE is not fully supported. Most features of the addon should work but there may be issues with material prioritization that was added with the updates. If UPBGE replaces the old game engine in blender I will ensure the addon supports this, but until then it will only work fully with the game engine that comes packaged with blender. Can this be used for Cycles/Blender Internal renderer? No, it cannot, this will only work in the Blender Game Engine (because of the python scripts). Do I need to know code/python to fully utilize this addon? No, to fully utilise this addon all you need to do is have a basic understanding of logic bricks which are relatively straight forward (input--process--output). Will I need to have prior BGE experience to use this? To make a game: Yes, however, the addon comes with a demo game file which you can use as reference and there is plenty of BGE tutorials to help you get started. This item has an average rating of 4 from 6 ratings by the community. Trying to initiate event based vertical scrolling in a direction based on a ray sensor but having trouble after connecting the wire automatically connected with the keyboard sensor. Hi, thanks for the program. but in FAQ you said it doesn't work with UPBGE, but I just tried it with the tank game demo, and it works! the only thing i had to change was the True Level triggering of the left mouse button sensor with the skip set to something like 40. I am not sure if there is something else that doesn't work or some sort of bug I still didn't encounter... anyways, thanks! I gotta say, this addon is the best I've seen for animating textures in Blender's Game Engine. It's easy to use, it just works, and the Events feature is perfect for sophisticated 2D character movement cycles. While this addon is largely advertised for those who don't know how to write Python scripts, if you do have some Python scripting knowledge you can take the scripts that are generated by this addon and tweak the logic however you like. It's very flexible. I'm glad I purchased this. Very useful and a needed expansion to the Blender included mechanic. However sometimes random bugs appear and I really hope for some fixes soon. Also I would really like to see this work on meshes that aren't some sort of plane or if it already does somebody to tell me how. Hi phmage, thanks for your support! If you are encountering bugs please report them (button in addon preferences), otherwise you can send me a PM here or email me (email at the bottom of the user manual). I will try solve all reported bugs asap. Standard meshes should work as well using the addon, just apply the standard settings like you would for a plane. Great addon, I would definitely recommend this to anyone looking for a better animated texture solution in Blender! The support if you do have issues is great as well!